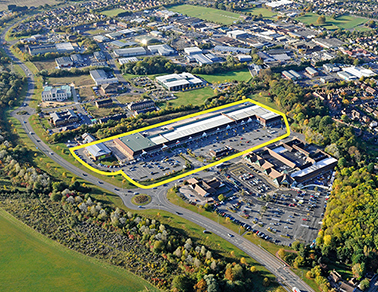 Prime retail park serving a wide catchment area located next to Morrisons Supermarket. The retail park is situated to the North-East of Malvern town centre fronting Roman Way. A terrace with 15 retail units together with drive-thru restaurant totaling 137,440 sq. ft. with 592 customer car parking spaces. The scheme has the benefit of an Open A1 planning permission. Enlargement and setting out of rear service yard for staff parking. Provision of a secondary access. Provision of an overflow car park. Addition of two new units totalling area 9,295 sq.ft on the former garden centre.